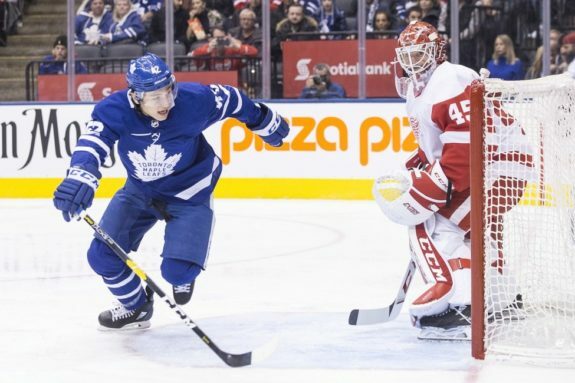 On Thursday, Jan.3, 2019, the Toronto Maple Leafs play their first game of the new year against the Minnesota Wild. 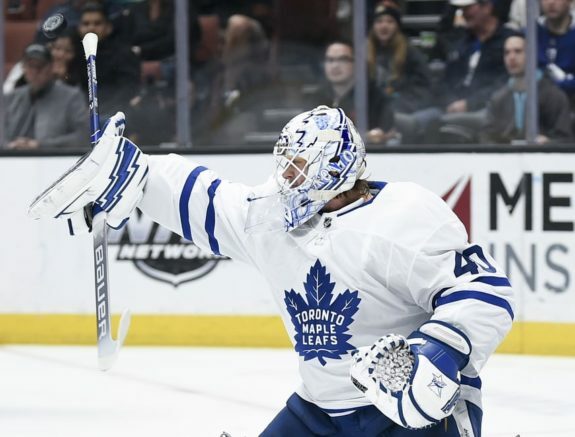 Frederik Andersen (out with a groin injury) will not return to the lineup and head coach Mike Babcock didn’t have an update about Andersen’s return. Although Andersen was on the ice prior to Wednesday’s practice, he didn’t practice with the team. Here’s a look at the Maple Leafs’ news as the new year begins, as reported by those who cover the Maple Leafs. Trevor Moore, who was loaned to the Toronto Marlies on Dec. 31, will likely be in the Maple Leafs’ line-up for the game against the Wild. He is on an emergency recall, the team announced Wednesday; it’s the sixth time Moore has been recalled from the Marlies this season. So far, Moore has played three games with the Maple Leafs and has tallied two assists. His entry-level contract offers management some flexibility and the 23-year-old Moore is likely happy to move back-and-forth between the big club and the Marlies. Moore is a former college free agent who, in 27 games with the Marlies this season, has 17 goals, seven assists, and 24 points. Moore is expected to play on the team’s fourth line with Frederik Gauthier and Par Lindholm. When coach Mike Babcock reflects on this season, he reminds his players that, although they had a good first half of the season and won lots of games, the team is “in a spot that we expect more and would like to get more, so we have to improve on how we play if we’re going to get more.” Although his wording is vague, it means Babcock thinks the team’s play can and should improve. As I noted in an earlier post, I believe the Maple Leafs need to overcome a pattern of play that often puts them in a scrambling-from-behind position. The Maple Leafs’ 26-11-2 record has them among the top NHL teams, but that won’t be enough. Babcock and the Maple Leafs’ players realize their season will be judged by a good or bad playoff success. In the meantime, improving throughout the season is the goal. Related – Maple Leafs’ Coach Mike Babcock: Pedigree or Problems? On Jan. 2, 2019, Sportsnet’s Luke Fox reported his NHL’s power rankings: The Tampa Bay Lightning are first (it sometimes seems they might never lose another game), the Washington Capitals are second, the Winnipeg Jets third, and the Maple Leafs fourth. Fox noted the need to rest Andersen and allow the Maple Leafs’ backup goalies more time in net. Keeping Andersen fresh for the post-season is a priority. 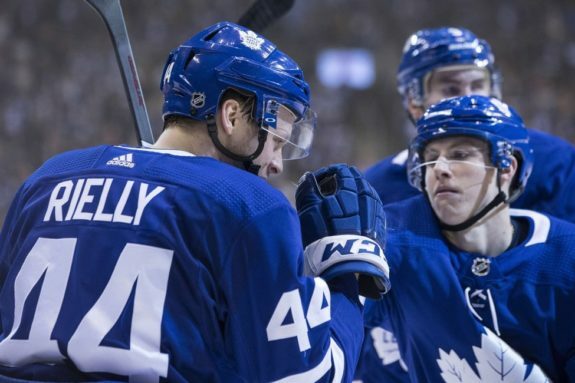 Josh Wegman of The Score noted that it’s remarkable that Morgan Rielly is on pace for 93 points as the Maple Leafs bump up against the midpoint of the season. Although Rielly might not be elite defensively, he is threatening to become the first defenseman since Ray Bourque’s great 1993-94 season to reach 90 points in a season. That, Wegman notes, gives him an advantage for the Norris Trophy. He notes that Thomas Chabot, a fine Ottawa Senators defenseman, was excluded from the list because he’s out for an extended time with an “upper-body” injury. He also expects the Leafs to add a second defenseman. Once teams fall out of the playoff race, he believes the Leafs will make a move or two. Wegman doesn’t think the Leafs will risk relying exclusively on Garrett Sparks, in case Andersen goes down. He believes Sparks deserves a chance to start but the team will want more “back-up to the back-up” than they gained with new goalie Michael Hutchinson. Since Nylander has returned to the line-up, the Leafs have improved. When he’s on the ice, the team is +10 in shots and +12 in scoring chances. As Wegman notes, Nylander “makes everyone he plays with significantly better and has been his old self for several games now” and will soon start getting points to match his play. The Maple Leafs have an important homestand, and perhaps it’s important to regain those players who have been lost to the regular line-up. These players’ return would be a great New Year’s wish. Related: Babcock’s “Ontario Guys” Evolution: Is Don Cherry Right?